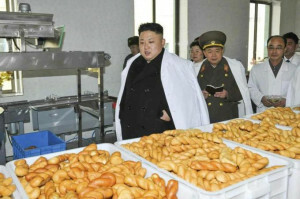 Though the DPRK could import food from the COMECON bloc of countries led by Marxist-Leninist governments, this was still a weakness. Kim Il Sung and the Korean Workers Party emphasized “Juche,” or “self-reliance” and pushed the country to carry out the very difficult task of ending reliance on food imports. The stated goal was “food independence.” The DPRK began constructing wheat fields on the sides of mountains, making huge efforts to grow food in mountainous regions and ending the reliance on imported food. When the Soviet Union collapsed in 1991, along with the various Marxist-Leninist governments of Eastern Europe, the international oil markets were dramatically altered. The DPRK could no longer purchase oil from the Soviet Union. With COMECON no longer in existence, OPEC was dominated by US and British aligned governments, and mandated that the purchasing of oil only be done with US dollars. The DPRK was also unable to continue exporting coal and other products like it once had.